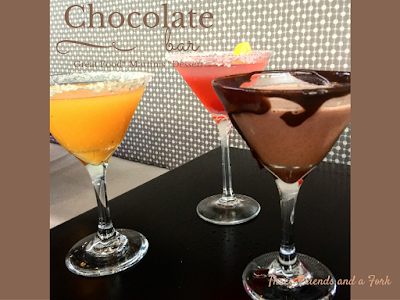 I can't think of a better place to have a fun night out with girlfriends than a restaurant that has both chocolate and martini in its logo. When my friends Merri and Julie called and suggested going to dinner, we all agreed we needed to check out the Chocolate Bar. Located in Huntsville's new Twickenham development, Chocolate Bar is next door to Publix and right across the street from the Cajun Steamer at 300 Pelham Ave. SW. We all love this new area near Huntsville Hospital. It has shops, restaurants, and condominiums with lots of sidewalks and lights. The first thing we saw when we entered the Chocolate Bar was this case filled with desserts. This looked promising! As we walked to our table, we looked around the chocolaty interior of the restaurant. Chocolate details were everywhere. The room was even divided with giant cacao pods strung from lines. Very cool! It was such a nice night, diners were seated on the outdoor patio. We studied the extensive menu. There were lots of drinks, appetizers, entrees and desserts. The drink menu was exciting. The mojito menu alone included eleven alcoholic and seven non-alcoholic options. Beer, beer tails, wines, champagnes, hot chocolates, alpine chinos, flights, bombs, non-alcoholic drinks and martinis. You just need to go look at the menu! While we were deciding, our server brought out glasses of water. I promise this is not trick photography. Those water glasses were leaning! Either that or just looking at that menu made us light-headed. We finally decided to try three martinis. Merri got a cherry lemon drop, I got a Georgia peach and Julie hit the ground running with a chocolate salted caramel. They were delicious. Between the two fruity martinis, we liked my Georgia peach the best, but Julie's chocolate martini was in a league of its own! It was crazy good. On the appetizer menu, we quickly zeroed in on the sweet potato fries with a trio of dipping sauces. We love dipping sauces! We agreed these were some of the best sweet potato fries we have ever had. And the sauces? Maple mayo, rosemary butter and dark chocolate...they were all wonderful. After debating the merits of just about every item on the entree menu, we finally settled on three sandwiches and asked our server if he could have each sandwich cut into three pieces so we could each taste every sandwich. Don't you just love eating with women! Guys would never go for this! Merri got a smokey grilled cheese, I ordered a roasted chicken and Julie went with a steak BLT. We loved them all. The grilled cheese had applewood smoked bacon, cheddar cheese, smoked gouda and tomato on a grilled sourdough. My roasted chicken came with spinach, sun-dried tomato pesto and homemade mozzarella on a rosemary foccacia. Julie's sirloin steak sandwich was filled with lettuce tomato, provolone, applewood smoked bacon and basil mayo on a grilled foccacia. We loved each and every one and picking a favorite would be hard. The grilled cheese was a favorite and the steak might have edged out the roasted chicken by a tiny margin. All of our sandwiches came with a pickle spear and chips. Finally, we were ready for desserts. Merri decided her dessert should be liquid, so she ordered one of the chocolate salted caramel martinis. I can't pass up strawberries and chocolate, so I ordered Dip Your Own Berries. I got a platter of fat, red strawberries with a decadent cup of warm dark chocolate for dipping. Julie had a turtle cheese cake which was flat out amazing with chocolate, vanilla, caramel and toasted pecans. We were all really happy with the desserts we chose. Three Friends and a Fork give Chocolate Bar 3 Decadent Yums UP!